The continuing evolution toward advanced miniature packaging has led to ever increasing PCB density and complexity. As the manufacturing process becomes progressively more complicated, there is an ever increasing probability for defects to occur on finished PCB assemblies. For years the Automated Optical Inspection (AOI) industry has relied solely upon two-dimensional (2D) inspection principles to test the quality of workmanship on electronic assemblies. While advancements in conventional 2D optical inspection have made this technology suitable for detecting such defects as missing components, wrong components, proper component orientation, insufficient solder, and solder bridges; there is an inherent limitation in the ability to inspect for co-planarity of ultra-miniature chips, gull-wing leaded devices, BGA’s and LED packages. True co-planarity inspection of these challenging devices is an absolute necessity and literally requires the addition of a third dimension in inspection capability; 3D inspection technology. It is important to understand that there are advantages and disadvantages associated with both 2D and 3D inspection technology. 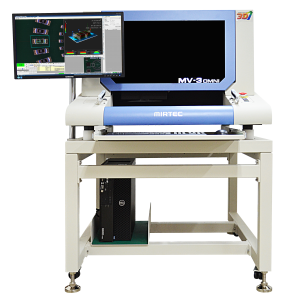 In order to achieve the highest level of quality assurance the AOI system must, therefore, employ a combination of both 2D and 3D inspection technology in a single platform.